The Axco AX80 is an ideal hand gun for bulk hot melt dispensing. The major advantage of the Axco bulk glue gun is you save on the cost of adhesives. Since bulk hot melt less expensive than sticks using the AX80 will help reduce your overall operating costs. 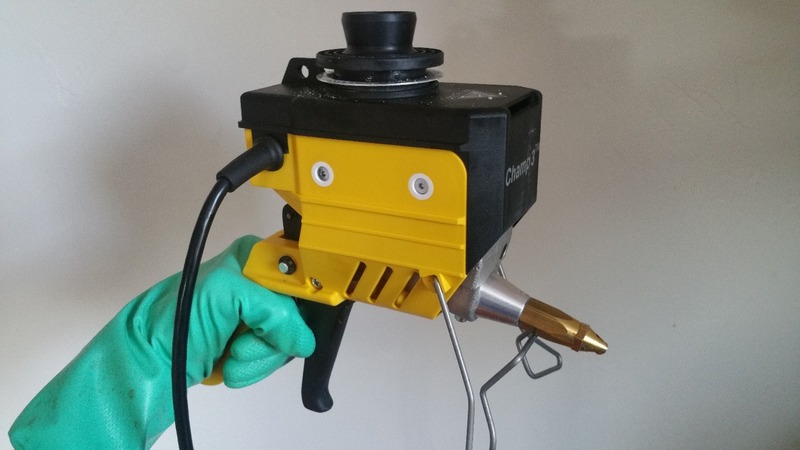 The AX80 bulk hot melt gun works wonders as an industrial dispensing tool and features a 5oz hot melt tank. This bulk hot melt gun is easy to operate just plug it in and about 10 minutes later the AX80 is ready to help you with product assembly, bookbinding, packaging or whatever your application. This industrial hot melt dispensing hand gun has the output rate of 1 pound of hot melt per hour. The best part is this heavy duty glue gun doesn't require cumbersome hoses or an air compressor. This bulk gun weighs only 1.8 and has an adjustable temperature control. If you have any questions on the AX80 or bulk hot melt for your application feel free to contacts us! Heat Output: 200 Watts Max. Gun works, difficult to set temperature. While the gun works fine, it is difficult to accurately control the temperature. Gun was purchased in part because it offered a thermostatically controlled adjustable temp. However, there are no markings on the temperature adjuster, and the adjuster requires a screwdriver. Using a digital thermometer is difficult to accurately gauge the temperature because readings vary quite a bit depending on how the thermometer is aimed.